It’s time for Interim Budget 2019-20. After presenting budgets for the five consecutive years, BJP led NDA government has presented interim budget 2019. The budget was presented by Finance Minister Piyush Goyal. It is known as an Interim budget as it is announced by the government before the election. The expectation from the budget was very high. It was expected that it will be a please-all budget. If we look at the last five years budgets of BJP government especially income tax part, the common man has got disappointment only. Tax limit was revised only once in FY 2014-15 budget from 2 Lakh to 2.5 Lakh. In rest of the budgets, only a few small benefits were given. Overall from last five years budget, the common man has concluded that “No Acche Din ahead.” However, Interim Budget 2019 is slightly different. This time it is pleased-all budget. Maga tax relief is announced for the middle class in budget 2019. Lot of other benefits are also proposed. Let’s look at Key Announcements of Union Budget 2018-19. Income up to 5 Lakh is get full tax rebate. Overall benefit to tax payer is Rs.12500 per year. If you make investment of 1.5 Lakh under 80 C, you need not to pay tax up to 6.5 Lakh income. A limit of standard deduction is increased from Rs.40000 to Rs.50000. Last year this limit was introduced by the government in lieu of the exemption with respect to transport and medical expense reimbursement. Now limit is enhanced by Rs.10000. TDS limit on interest on bank and post office deposits is raised from Rs 10,000 to Rs 40,000. This means if you earn interest by making investment in fixed deposit or post office saving scheme, you need not to pay tax up to Rs.40000. Income tax filing interface will be further simplified. All income tax returns will now be processed in 24 hours and refunds will be issued simultaneously. This means you need not wait for processing of Income Tax return for getting refunds. The entire process will be streamlined within two years. All scrutiny will also be done digitally with anonymity. This will eliminate need of income tax officer and entire process would be online. Currently, income tax on notional rent is payable if one has more than one self-occupied house. No tax on notional rent on Second Self-occupied house has been proposed. So, you can now hold 2 Self-occupied properties and don’t have to show the rental income from second self-occupied property as notional rent. This will surely get advantage to people who are forced to maintain two house at two different location due to job location, children education etc. 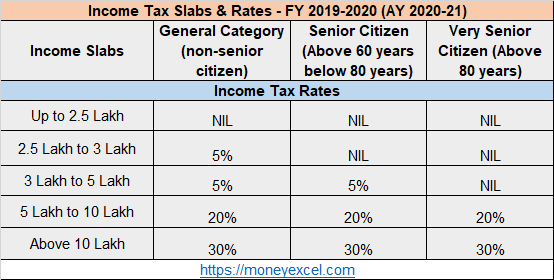 Income Tax Slab for FY 2019-20 (AY 2020-21) is given below. Budget 2019 announces mega pension scheme for unorganized sector workers. The mega pension scheme shall provide assured pension of Rs.3000 per month to unorganized sector workers. Guideline for selection is yet to be announced. New Pradhan Mantri Kishan Yojana is introduced. As per scheme Rs 6,000 per year will be given to farmers in three instalments. This benefit will be transferred directly to farmers’ bank accounts. The scheme applies to farmers with less than 2 hectares of landholding. The government announced eight crore free LPG connections under ‘Ujjwala’ Yojana scheme. Overall it is a very good budget. Modi Government has tried to lure the common man especially middle class with mega tax benefit. Tax breaks for the salaried, middle class, pensioners are being welcomed and is far more than expectations. It is a budget for the middle class. In addition to tax benefit this budget has also tried to give social security benefit to old people under new pension yojana. This budget has also given benefit to farmers by starting Pradhan Mantri Kisan Samman Nidhi scheme. For Middle class people up to Income 5 Lakh it is good budget. can NRI avail the senior citizen slabs benefit when filing income tax returns on the rental income accrued in india ? Yes they can avail for income earned from rent in India.